This is retrofuturism done right. Besides the paint job, here's the important stuff: 500 hp at the crank, 2,305 pounds (about 1,000 kilos for you of the metric persuasion), designed to accept a bolt in roll cage and because of the "Gurney hump" helmeted driver's up to 6'4" can hoon about to their heart's content. 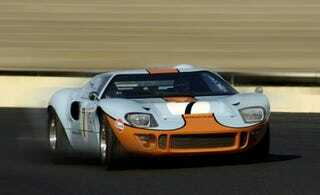 No, this isn't just a Ford GT with the world's greatest exterior. Auto Futura's CAV GT is actually a GT40 remake, combining (what they claim) is the best of the old world, with the best of the new. For instance, the chassis is still a steel monocoque, but modern welding and CNC-machining make the chassis even stiffer and stronger. And of course the brakes are the stuff that Ken Miles could only dream of back at LeMons LeMans. We'll take ten.